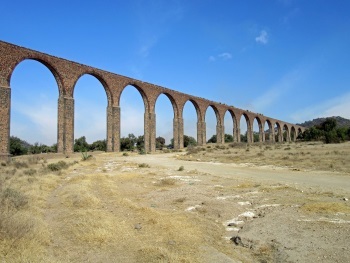 Photo provided by Jay T.
The 'Aqueduct of Padre Tembleque Hydraulic System' encompasses a 16th century canal system that is unique in the Americas. The system was initiated by Franciscan friars. Its design shows a fusion of Mesoamerican and European features. 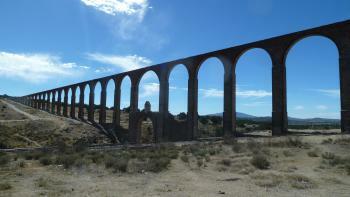 The hydraulic system lies between the towns of Zempoala, Hidalgo and Otumba, in the State of Mexico. Recently visited this site - before it made the list and consequently information at the site is pretty thin on the ground. The structure is quite impressive, and the length is even more so. I visited probably the most impressive bit - same picture as previous poster has put up. Getting here, as long as you have your own car is quite straightforward, and it was on our way from the coast to Teotihuacan. See this place in the evening, then night stop at Teotihuacan and then as long as it sin't a weekend get to see the pyramids all on your own at 08:00. Hopefully now being added to the site they will do something to clean up the river passing through the valley - just needs a bit of tidying really. there were lots of locals there, picnicking and a few on horseback, not sure why they were there. As a spectacle the aqueduct is pretty impressive but the story behind it reveals an interesting aspect of the European settlement of the Americas. For me the most interesting thing was how early in the European settlement this piece of infrastructure was built. It was started in 1553 (only 30 years after the conquest of Tenochtitlan) as such the impressiveness is somewhat amplified by its age. It shows how European authorities attempted to shape their environment, in a way that the native groups hadn't done before. There are also traces to show how native slave labour was used in the construction as there are apparently seals highlighting the works of indigenous masons, I had a quick look but couldn't find them. The whole structure is rather long (48km), most of it runs underground but there are three above ground arcades as they cross valleys, we visited the largest of these just outside the town of Santiago Tepeyahualco. It is actually only about 30km from Teotihuacan, however the slow progress over cobbles in town and the lack of an eastbound access point to the highway make it a slightly longer journey than it seems on paper. Amazingly the gravel track beside the aqueduct was even fitted with two newly constructed road bumps; it was nice to see that nowhere was immune to this peculiar addiction of the Mexican road system. A visit can be over and done with in five minutes, but the main aqueduct we visited was interesting and tells a rather fascinating story in the European conquest and settlement of the Americas. We found this quite by accident. I was amazed by the work and the enormity. It was incredile. Unfortunately, there was no one to tell us about the site and no signs. So now I am left to search the internet to explain what I saw.